The Doctors from University College London Hospital managed to find something different way of saving baby's life. 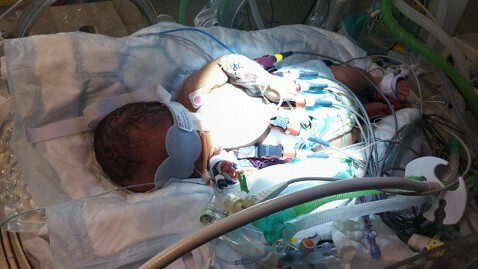 They "freeze" the baby to save his life, according to report by ABC site. Claire Ives, a seven months pregnant with her third child baby who named Edward Ives. He was born with diagnosed with supraventricular tachycardia or SVT. Edward's heart rate condition was nearly double the normal (300 beats per minute). The Doctors decided to freeze the baby to lowered his temperature to 91 degrees - "in order to protect his vital organs and slow his heart rate." And soon they find out that raising Edward's temperature slowly over a couple of days was the way to go. Edward's temperature was raised one half degree every 12 hours and his heart rate remained steady, according to Doctors. And now, so far so good, Edward Ives is now 6-months-old and he is doing great. He is still monitored by the Doctors in University College London Hospital. Comments or suggestions about "Doctors 'freeze' baby to save Life" is important to us, you may share it by using the comment box below.